The timeless strength of steel is paired with the natural warmth of solid wood, making our Lahoma bench warm and inviting, while ensuring generations of continued service. Keeping things simple, our Lahoma bench features think planked top, with breadboard ends that are mounted with two solid cast iron legs, featuring the words "Made in USA" on the sides - giving it the right touch of charm. On each leg, two adjustable feet are used to match the contour of any floor, ensuring a wobble-free seating experience when paired with your dining table. Match the Lahoma bench with the Lahoma dining table, wine server, and dining chair for the perfect set. Made to order, each bench is available in a variety of size, wood, and finish combinations to ensure your new bench complements the rest of your space. 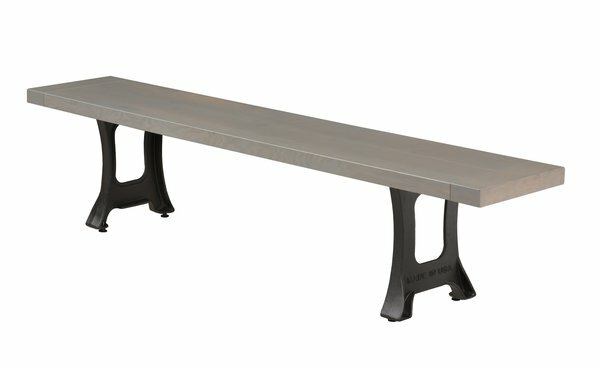 Each wood and metal dining bench is made to order and backed by a 20-year warranty, giving you the peace-of-mind in knowing that it's made to last. Call one of our furniture specialists today to answer any questions you have on our Lehoma collection.